I joined the band as a 12 year old in 1962 when it was known as the National Youth Brass Band of WA. I joined playing 2nd Euphonium, but fairly quickly graduated to Principal. I played with the band until 1978. During this period with the band I won the State Open Solo Championships in 1974, as well as being State Euphonium Champion on other occasions. When I left the band I decided to travel to the UK, where in 1980-81 I played in the Loddon Band, which at that time was a 4th section (village) band. My enduring memory of that band is going around the village playing Christmas carols in the snow in freezing conditions!!! On my return in 1981 I joined Canning City Band, where I stayed until early 1984, when I decided to take a break from banding. That didn’t last long, as later the same year I re-joined this band on Principal Baritone when it was known as Channel Nine, and I am still here!!!! 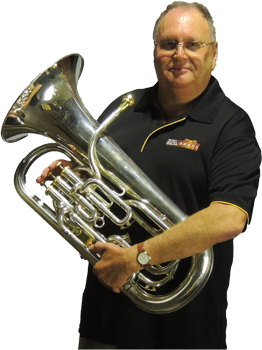 After playing Baritone for a while, I then moved on to 2nd Euphonium (Alan Lourens, Principal), and finally back on Principal Euphonium. During this period I have won 3 Norm Snow Best Brass Instrumentalist awards, in 1992, 2000 and 2006. Overall I have been with RASWA Brass for around 46 years. In December 2010 I was made a Life Member of the band. My musical journey, like many others, started in primary school. My Dad, being a music teacher of woodwind and piano wanted to start me young, but of course I wouldn’t have a bar of woodwind or piano! I decided I would rather play brass instruments! (I vaguely remember my dream at that age being to play the tuba!) It turned out I had some natural musical talent when tested in primary school so I started playing the Trumpet at age 10 (and it just so happened I was taught by Glyn MacDonald, RASWAs current principle trombonist!). After learning trumpet for a couple of years I won a scholarship to study music on Euphonium at Churchlands SHS, and I graduated in 2004. 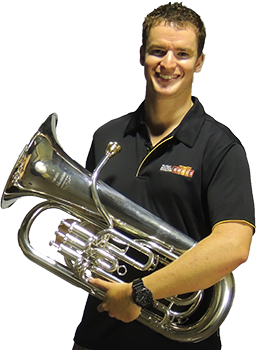 I joined Midland Brick Brass in 2005 as well as starting a music degree at UWA on the Eupho. I decided studying music wasn’t for me so I changed to a degree in Botany after 6 months. Due to my love of playing music I decided to continue with the band. I switched to Tuba in 2007 which I played until 2010 before going on a trip around the world for a year, visiting Europe, South America, Canada and the USA. Before travelling I’d thought about going back to uni to study Physics and Engineering so when I got back I started a Physics and Nanotechnology degree part time at Murdoch University whilst working as a botanist. I really missed being part of the band, and after seeing them blow the house down at the Perth National Band Championships I decided I had to rejoin! I’m now back to playing Euphonium and loving every minute!